UN chief Ban Ki-moon was to make an unannounced visit to Israel and the Palestinian territories Tuesday to try to calm nearly three weeks of violence that has raised fears of a full-scale uprising.Ban's visit comes with young Palestinians defying an Israeli security crackdown and calls for non-violence from Palestinian president Mahmud Abbas to carry out repeated knife and other attacks on Jews. There have also been violent protests across the Palestinian territories.International concern has mounted, with US Secretary of State John Kerry due to meet Israeli Prime Minister Benjamin Netanyahu in Germany this week and Abbas later at an unspecified location in the Middle East. Israel took further steps Tuesday as it sought to deter violence and tamp down what it sees as incitement, destroying the home of a jailed Palestinian attacker in the West Bank and arresting a senior Hamas official. Last week, the Israeli government ordered an intensification of punitive home demolitions in response to the wave of unrest.Last week, the Israeli government ordered an intensification of punitive home demolitions in response to the wave of unrest. 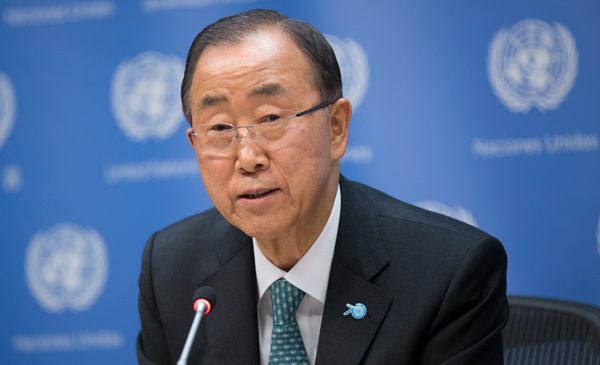 Ahead of his visit on Tuesday, Ban said he understood Israelis' anger at attacks, "when children are afraid to go to school, when anyone on the street is a potential victim." "But wars, checkpoints, harsh responses by the security forces and house demolitions cannot sustain the peace and safety that you need and must have," he said on UN TV. "There is no so-called security solution. "He also told Palestinians that "I know your hopes for peace have been dashed countless times. You are angry at the continued occupation and the expansion of settlements. "Ban however urged a "peaceful voice for change. "At least 41 Palestinians have been killed in the upsurge in violence that began at the start of the month, including alleged attackers. Eight Israelis have died. Israeli security forces have found themselves seeking to clamp down on unrest while not provoking a further escalation of violence. But checkpoints in Palestinian areas of annexed east Jerusalem, where many of the attackers have come from, and measures such as home demolitions have provoked further anger. Videos of Israeli security forces shooting dead alleged attackers that have spread online have also fed unrest, with Palestinians seeing some of the shootings as unjustified. At the same time, the gun, knife and car attacks have sparked fear among Israelis, and some politicians have urged residents to arm themselves in the face of the violence. Human rights activists blamed such comments in part for an incident on Sunday night, when an Eritrean man was mistaken for an attacker and killed in the southern Israeli city of Beersheba. The mob violence came after an Arab Israeli gunman also armed with a knife stormed a bus station, shooting dead a 19-year-old soldier and wounding around 10 others. The gunman was killed, while a security guard at the bus station shot the 29-year-old Eritrean thinking he was a second attacker. A mob also beat him, and the man died later. Netanyahu warned Israelis against vigilantism after the incident, saying no one should "take the law into their own hands. "Early Tuesday, Israeli troops destroyed the West Bank home of a Palestinian jailed for killing a Jewish settler in a knife attack late last year. The demolition of the home of Maher al-Hashlamoun in the flashpoint city of Hebron was accompanied by clashes between dozens of Palestinian stone throwers and Israeli soldiers, witnesses said. Hashlamoun, a member of radical group Islamic Jihad, was given two life sentences by a military court in March for the November 10, 2014 murder of Dalia Lemkus, 26, and the attempted murder of two other people on a road in the Gush Etzion settlement bloc, south of Jerusalem.Separately, soldiers also arrested one of the top West Bank leaders of Islamist group Hamas, Hassan Yusef, in an overnight raid near Ramallah. The military alleged that Yusef had been "actively instigating and inciting terrorism and publicly encouraging and praising the execution of attacks against Israelis. "Yusef, a founding member of Hamas in the late 1980s, has spent years in Israeli jails. He was elected to the Palestinian parliament from prison in 2006 and was only released from his last stint in jail in June. He made headlines during the second Palestinian intifada, or uprising, of 2000-2005 when he renounced his son after he admitted to informing for the Israeli security services under the codename Green Prince.